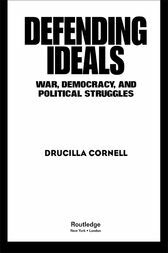 In this book, Drucilla Cornell examines the crisis on the left and asks how we can turn back toward more left-wing ideals. She looks at the meaning of freedom through various lenses as well as the dissolution of feminism. She discusses and critiques such major thinkers as: Amartya Sen, Adorno, Martha Nussbaum, John Rawls, Richard Falk, and Paul Berman among others. Drucilla Cornell is Professor of Political Science, Women's Studies, and Comparative Literature at Rutgers University. She is also a playwright and the author, most recently, of Between Women and Generations: Legacies of Dignity (2002).